And there’s the rub. The idea of nominal GDP-targeting would threaten the Fed’s hard-fought credibility as an inflation-killer and raise expectations of future inflation simply to jimmy the unemployment rate a point or so lower than it would be five years from now. No. There might be higher inflation in the short-run, but over the long-run a NGDP level target would anchor (see the red line) nominal expectations. But even then, some higher inflation over the short run is actually justified. For it would restore nominal incomes to where they were expected to be when debtors and creditors agreed to nominal contracts and similarly it would return debt burdens to the path expected when the contracts were signed. [M]arkets [may] begin to worry that the Fed won’t be able to unwind its positions in a timely manner to prevent an uncontrolled inflation surge...That concern is well justified, according to R. Glenn Hubbard, dean of Columbia’s business school and potential Fed chairman if a Republican wins the White House in 2012. As he told me recently: “In the near term, it’s hard for me to imagine that [NGDP-targeting] would work much differently than what the Fed is currently doing, which isn’t exactly a booming success. And then in the longer term, I would worry about inflationary expectations becoming unhinged…. No. 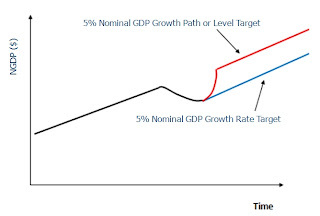 Hubbard is thinking of a NGDP growth rate target (the blue line.) Advocates of NGDP targeting are thinking of a level target (the red line) which implies more aggressive but systematic monetary stimulus. And no, the inflation expectations would not get unhinged because this is a level target. As we learned from FDR's experience with level targeting in 1933-1936, such an approach can do wonders for the real economy and still maintain a nominal anchor. Ben Bernanke knows all this and advocated something like it for Japan. Consequently, I do not think he is worried about unmooring inflation expectations, but is concerned about the politics of adopting such a new rule. If Republican leadership would give NGDP level targeting a fair hearing they might actually like it. And NGDP growth since the official end of the recession has averaged only 2.8%! Little more than half the growth rate along the previous path. Even if you assume the new path is lower than before, the "hole" is only getting bigger! "[M]arkets [may] begin to worry that the Fed won’t be able to unwind its positions in a timely manner to prevent an uncontrolled inflation surge." The reflects a concern I have. Starting from deep recession when a lot of new money has been created in order to get NGDP back on target is there not a possibility that at some point confidence reemerges and people actually want to spend all that (till then) hoarded money in a hurry (before the govt takes it back)? Even with an NGDP target how would you get it out of the system quickly before inflation takes hold without squeezing the life out of any recovery ? Hubbard's, "timely manner" comment is wrong for another reason: In a FFR targeting regime, the supply of bank reserves is always perfectly elastic. Whether the initial condition is zero in ER's or $10tr in ER's is therefore immaterial to the potential supply of bank reserves. Whatever banks need to support new deposit creation (i.e. lending) at a given FFR, the Fed will always provide. What is it with economists and their peevish fixation--really, an unhealthy obsession--with inflation? I get the feeling that some economists live in abject terror of prosperity as it might possibly lead to inflation. The experience of 1982 to 2008, of 26 years of solid growth and moderate inflation between 2 percent and 6 percent. Of course, we should hustle this economy back to trend level. Moderate inflation would be a small price to pay. As for the Chicken inflation Littles---there has been hysteria about potential inflation all through this recession, in response to the Fed's QE program and low interest rates. Instead, right now we are seeing declining unit labor costs, a DJIA at 1999 levels, real estate for half off, and the last two CPI reading have been negative. "Better to forego the prosperity, rather than risk inflation"--motto of Glenn Hubbard. PS When we get a GOP president, will Hubbard so pompously pettifog about inflation? Or will it be time to consider monetary stimulus? I have a problem with a level target. 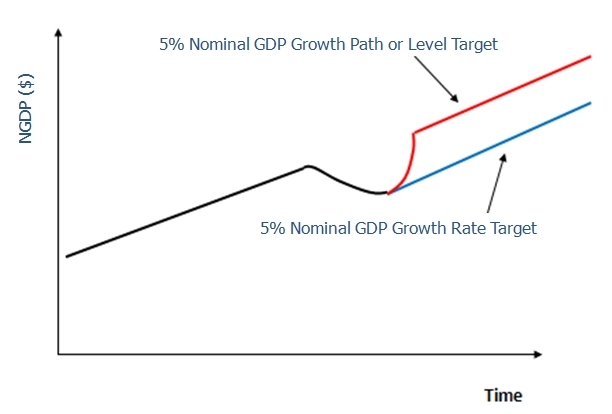 All the commentary I have seen from advocates of level targeting take the peak level of 2007 as "normal" and then tack on 5% growth rate (or so) to come up with a target. The problem is the assumption that the peak consumption at the height of the biggest credit bubble in history was somehow "normal". NO. And who is to say that the normal growth of our GDP has not geared down to 3-4% (nominal) because there is no one investing in new capacity. This is exactly what happened in Japan. This kind of trend analysis is better suited to first year wall street analysts and does not befit a trained economist.